Since our house was painted Muted Mulberry, I had to do more research on the health benefits of the fruit and leaf itself. It seemed only fitting. Mulberries (Morus nigra), are produced from the Morus Alba tree and are packed with loads of nutrition, and are scrumptiously delicious. 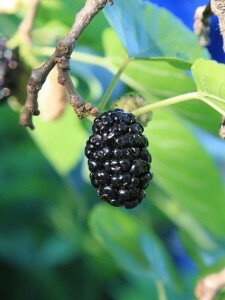 Mulberries look very much like a black raspberry and they come with their own natural sweetness. Mulberries are grown in warm climates all over the world. This versatile fruit and can be easily used in many recipes including jams, jellies and other tasty recipes. Mulberries are packed with nutrients such as protein, iron, calcium, fiber, and are a great source for Vitamins C, E, and A. The berries are loaded with antioxidants that help to repair free radicals in your body. Antioxidants can help to promote heart health. The fruit can be used to make a juice. The juice of the mulberry fruit contains reservatol, which is a potent phytonutrient that studies have shown to prevent some cancers. The juice made from the berries is also an excellent anti-inflammatory. In Traditional Chinese Medicine (TCM), the berries are used as a tonic for the blood, as well as to strengthen the kidneys. The properties of the berries help to improve circulation. It’s high Vitamin C content makes mulberry extremely useful for warding off a cold or flu. The berries can be taken as a tea, or made into a syrup. Vitamin C is a natural immune booster. Mulberries can also help to control and maintain a balanced blood sugar. The flavonoids present in the fruit helps to reduce the rise and fall of sugars in the blood. Due to the high Vitamin A content of the berries, mulberries can help to improve vision. Vitamin A is the key vitamin to healthy eyes. Add them to your smoothies, make a syrup, or drink as a tea. No matter how you take your mulberries, it will benefit your health.